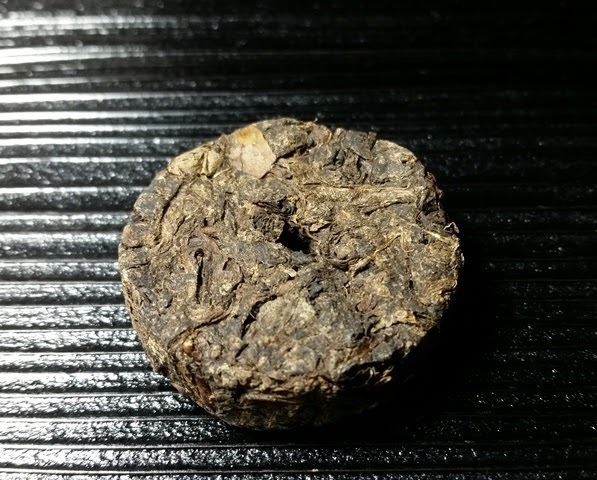 Product Description: This jaksul ("sparrow's beak") joongjak (third pluck) Cheong Tae Jeon (Coin Tea) was hand harvested from 100% wild-growing tea plants found in the forested mountains in Jangheung county, South Jeolla Province, Korea after Ipha (the first day of the summer season). 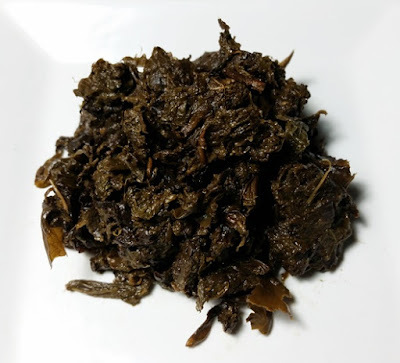 The tender leaves are then hand processed -- wilted, oxidized, steamed, dried, molded and aged for over two years. This tea improves with age. 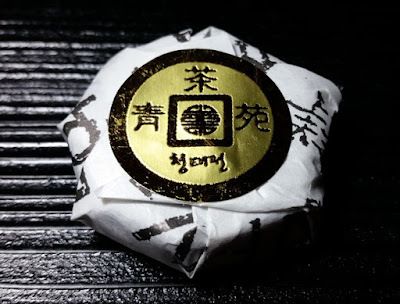 Three coins are packaged in a traditional Korean cloth coin purse. 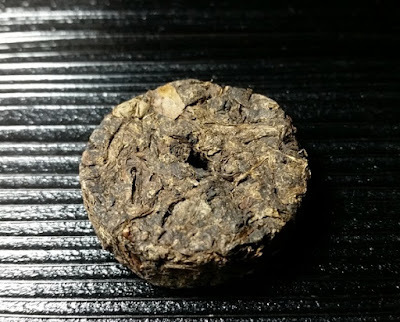 The dry leaves have an aroma of warm hay, sweet oats, a touch of smoke, and a hint of pepper. The golden orange infusion has a mildly sweet and smoky aroma with a sweet taste that reminded me of caramel and a hint of cinnamon. Following the first infusion the color, aroma and taste mellow while retaining a pleasant sweetness throughout. The dry leaves after roasting have an sweet aroma of warm hay and I was reminded of a compressed heicha. 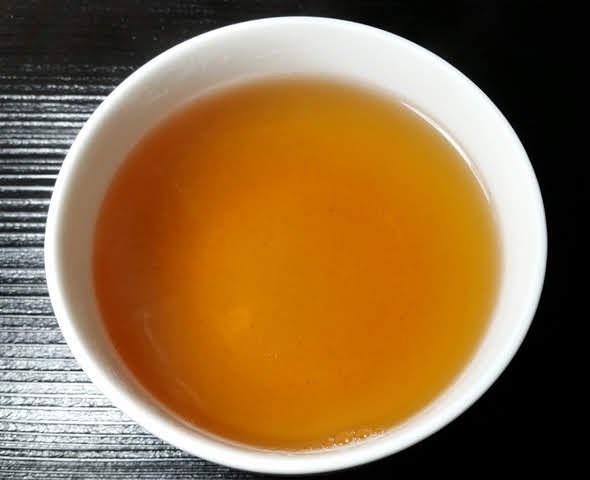 The copper orange infusion has a rich and toasty aroma, sweet, with a faint medicinal note. The taste is mellow and sweet with surprising caramel notes. The finish reminded me of the distant echo of a baked fruit tart some time after it's been eaten. There are several ways to go about roasting this tea, including the oven method I used. Nicole Martin describes her experience using the stove top method at Tea For Me Please. Geoffrey Norman takes us through his experience roasting the tea over an open fire at Steep Stories. Cinnabar describes a traditional charcoal roasting method at Gongfu Girl. I definitely recommend roasting the tea before boiling because it allowed the leaves to loosen and open up, developing more flavor. Letting the roasted tea float loose in the pot while it boiled may also have contributed to the improved flavor. Unroasted tea in a large infuser still retained much of its coin shape after a 10 minute boil. Have no fear! If you're like me and forget purposefully skip the roasting step, you can still look forward to a nice brew. After straining out the tea leaves, I also recommend allowing the liquor to rest for a few minutes before drinking, as it seems to develop a deeper, richer flavor. The first cup fresh from the boiling pot was nice and the second cup from the same batch that had been sitting for ~5-7 minutes was even nicer.